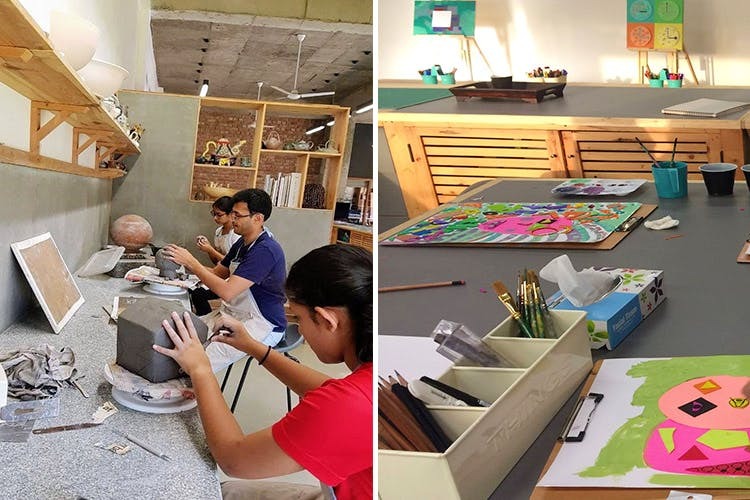 The Art Room in Gurgaon is an art and ceramic studio that offers design workshops for different skill levels. This cosy, collaborative space has been artfully created with repurposed materials to support a culture of sustainability and experimentation. You know you have an artist in you waiting to rush with your brush, but instead you only find yourself rushing for one thing – the office shuttle bus. We urge you to put an end to this monotony and nurture your long-lost hobbies instead. And one of the most therapeutic ones includes a brush, a canvas and, naturally, your imagination. The Art Room’s drawing and art apprenticeship courses are open to people of all ages, and classes happen in the evening so no one needs to mess with their morning schedule. Another reassuring bit: Your artistic ability (or the lack of it) won’t be any deterrent here – the courses are tailor-made for different skill levels. We’re told that everyone, from a happy three-year-old to a serious art student gets to experiment, explore and create art without inhibitions. Think easy-peasy printing, painting and story-boarding for toddlers, and art history and urban perspective for art apprentices… Skill-appropriate stuff, you see. The classes are facilitated by good-natured and talented artists who love seeing your ‘creative face’ as you make modern art that no one (but you) can decipher. No, seriously – creativity is subjective, and so what if your painting doesn’t make sense if it at least makes you laugh (and hopefully, forget that abysmal appraisal at work)? We like that the studio is a stunner, with raw wood shelves, tables and an indoor and outdoor space. It’s also got a kiln for training ceramic artists to fire their pots while stopping to stare out of the window for some inspiration every now and then. The ceramic family weekend is getting our vote for a Saturday outing. Gather with the kids around the potter’s wheel, or make rudimentary clay pendants… there’s so much to (c)lay your hands on. Get all the info about the space and the many programmes here.